In our global society, Sunzi’s (Sun Tzu) Art of War is known as the most well-written and popular strategy classic from China. Some of the other popular Chinese military classics are Sun Bin’s The Art of War, Huang Shek Gong’s Three Strategies and Wuzi’s Art of War. Before Sunzi’s Art of War was written, there was Jiang Taigong’s (JTG) Six Secret Strategic Teachings (also known as The Six Strategies of War). Jiang Taigong was a real historical character named Lu Shang (also known as Jiang Ziya) who, in the 11th century BC, became advisor to King Wen and his son King Wu, founders of the Zhou dynasty (1122-771 BC). He was supposedly instrumental in aiding the fall of the Shang Dynasty (approximately 1700 BCE - 1045 BCE) and in establishing the Zhou (1045 BCE – 221 BCE). He was the prime minister for the first Zhou emperor and his loyalty and farsightedness in governing spread his fame throughout China. The legend of Jiang Taigong captured popular imagination. Jiang Taigong is honored throughout Chinese history as the first great military advisor and the father of strategic studies. He was credited with the feat of writing the first military strategic book Liutao (Six Secret Strategic Teachings). Liutao has been considered a highly important and proven source for military wisdom over the centuries, where it continues to be held in high esteem among contemporary Chinese strategy professionals. Note: The many interpretations of Jiang Tai Gong’s biography propelled this writer to focus on the apparent. Jiang Taigong (first known as Lü Shang of Lù-shi clan) was later known as Jiang Shang, then Jiang Ziya and Jiang Taigongwang). As Lu Shang, he served King Zhouwang, the last ruler of the Shang dynasty (16th to 11th century BC) as an expert in military strategic affairs. The Shang ruler was a tyrannical and corrupted ruler who spent his days carousing with his favorite concubine Daji and mercilessly executing or punishing honorable officials and all others who objected to his ways. After many years of working for the Shang ruler, Lu Shang detested him so much that he hoped that some day someone would call on him to help overthrow this evil tyrant. One day the Shang ruler came up with the extravagant goal of building 'Lu Tai' (deer platform) palace that would glorify him as a deity. This task became such a burden to the people that the hungry and sick were dying in the countryside. Lü Shang abandoned his post and left with his wife Ma-shi to go to the west. They suffered many years in poverty and his wife later left him. During that period, Lu Shang knew that he would have another opportunity that would utilize his talent. All he needed to do was to be patient. Lu Shang waited till he was 72 years old for the next opportunity to come along. After his wife left him, Lu Shang went to Wei-shui River (near today’s Xi'an) to fish, knowing that the future Zhou ruler Wenwang (located in central Shaanxi) would come along one day and meet him. The opportunity occurred one day, when King Wen decided to go hunting in the area near the river, where he saw Lu Shang sitting on the grass, fishing with a bamboo pole that had a barbless hook attached to it. (Some claimed that there was no hook on the line.) The hook was then positioned a few feet above the surface of the water. This unique act of fishing is based on Jiang’s theory that the fish would come to him of their own volition when they were ready. This action requires the fisherman to be patient and devise the philosophy of "if one waits long enough, things will come their way." 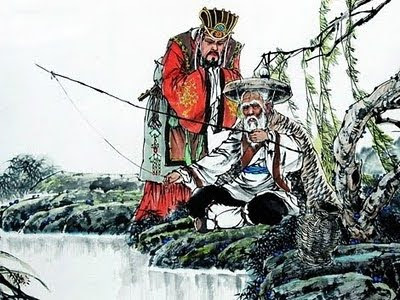 As King Wen of the Zhou state (central Shaanxi), saw Lu Shang fishing, he was reminded of the advice of his father and grandfather before him, which was to search for talented people. In fact, he had been told by his grandfather (the Grand Duke of Zhou), "… that one day a sage would come and help him to rule the Zhou state." When King Wen saw Lu Shang, he immediately felt that this was an unusual old man and began to converse with him. He discovered that this white-haired fisherman was actually an astute political thinker and military strategist. This, he felt, must be the man his grandfather had mentioned. He took Lu Shang as his coach to the court, appointed him the role of prime minister, and then gave him the title Jiang Taigongwang (Hope of the Duke of Zhou). This was later shortened to Jiang Taigong. One account of Jiang Taigong's life, written long after his time, said he believed that " … a country could become powerful only when the people prospered. If the officials enriched themselves while the people remained poor, the ruler would not last long. The major principle in ruling a country is loving the people through the reduction of taxes and slave labor. … " By following those ideas, King Wen immediately and rapidly strengthened the prowess and power of Zhou state. After King Wen died, his son King Wu, who inherited the throne, decided to send troops to overthrow the King of Shang. But Jiang Taigong stopped him, saying: "While I was fishing at Panxi, I realized one truth—if you want to succeed you need to be patient. We must wait for the appropriate opportunity to eliminate the King of Shang." Soon it was reported that the people of Shang were so oppressed that no one dared to speak. King Wu and Jiang Taigong decided this was the time to attack, for the people had lost faith in the ruler. ( You can find that specific point listed in Jiang's book) A bloody battle was fought at Muye (35 kilometers from the Shang capital Yin, now Anyang in the Henan province). With battle drums beating in the background, Jiang Taigong charged at the chief of the troops, with 100 of his men and drew the Shang troops to the southwest. King Wu's troops then moved quickly and surrounded the capital. Many of the Shang troops defending the capital were untrained slaves. They immediately surrendered, enabling Zhou army to capture the capital. The Shang king set fire to his palace and perished in it. As for Daji, one version has it that she was captured and executed; another version was that she took her own life. At that moment, King Wu and his successors established the rule of the Zhou dynasty all over China. Jiang Taigong was made the duke of the State of Qi (today’s Shandong province), which thrived with effective communications between the king and the people. He also assisted in building the economic state of Zhou dynasty. After some time, Jiang Taigong retired from his post before King Wu became wary of him. There are many variations related to the biography of Jiang Taigong. The two situations "Meet the King Wen" and "Advising King Wu" has been used on many levels to explain the significance of patience and control. The story also presents a sophisticated message that is applicable in any strategic scenario: "Wait until circumstances favor you." During his retirement, Jiang Taigong took time to write a manuscript on how to effectively lead an empire based on his conversations with King Wen and later King Wu (who succeeded to the throne on Wen's death). This manuscript was Tai Gong Liu Tao (translated as “Tai Gong's Six Secret Strategic Teachings”). It is consisted of advices on how to organize a potential empire, military advice describing methods of insurrection and revolution that were instrumental in the overthrow of Shang dynastic rule, and a wide range of strategic insights and tactical instructions in every arena of human activity. The Six Secret Strategic Teachings is a good book for "newbies" who are interested in strategic consulting and advising or understanding how the world works. These six chapters guided the readers in the art and science of effective strategy and leadership from a top to bottom mode. The first two "chapters" deal with the duties of the organization and the natural transition of power to the principal rival if the organization fails. This scenario can be described as a "respective" interplay of "yin and yang." The Civil Strategic Secret: The first chapter stresses the importance of recruiting talent, managing the organization, and valuing developing a proper relationship within your client and your own organization. Once the bond of absolute trust is established, they will do almost anything for you. The Dragon Strategic Secret: The emphasis is on how to lead wisely through various situations by understanding the developmental stage of the operational command, the organizational order, and the liaison. The Tiger Strategic Secret: The emphasis is on the tactical essentials, including matters related to proper logistics. # Side note: Logistics is the prevailing factor that wins the grand war not the tactics. The Dog Strategic Secret: This final chapter focuses on the tactical specifics for trapping the target (i.e., encircling and intercepting). There are also good pointers on selecting and training the desired professionals for a team and coordinating the personnel's and resources toward the target. This book was compiled into a single body of strategic work known as Wujing Qishu (also known as The Seven Martial Classics) during the Sung dynasty. It was designated as an essential material for the imperial military examinations and thus came to inexplicably affect subsequent military thought. Separately each of these seven classics complements each other in terms of strategic leadership. 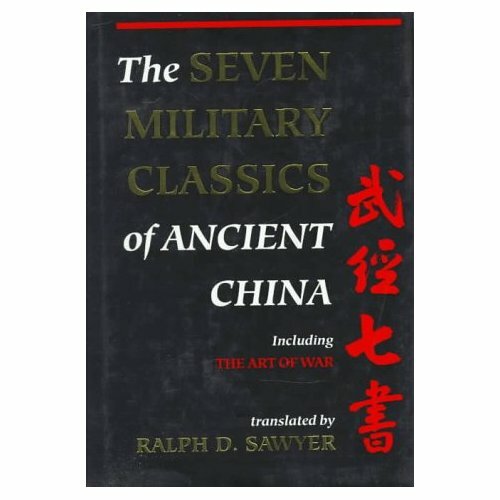 This set of classics was read by military officials and high government officials for many hundreds of years. It also played a great role in the socialization of scholars, officials, and military officers. The thoughts of Jiang Taigong have been known for 3000 years ago and we believed that it remains relevant for today's CEOs, managers, and leaders. His concepts of effective strategy and leadership have been widely reinterpreted and applied in the corporate world today. A sound appreciation of Jiang's concepts is a requirement for both sophisticated and budding strategic leaders. As mentioned before, reading this essay is a good fundamental start for those who wanted to start an uprising in their strategic setting. Two of the most important contents of this book can be found in Chapter 1 and Chapter 2 (civil secret teachings and martial secret teachings). It delineates the art of "suggesting ideas and perspectives" to people. These two chapters also outline what unique points to observe for. Those who are in the consulting business, might find these points to be quite useful. One significant lesson that can be learned from reading Jiang's essay was the importance of "thinking grand " in one's own aspiration. Inspirational leaders have a tendency of emphasizing on bold and empty messages. The messages do not mean much to their flock after the broadcasting is over. The next category is that small group of professionals are those who are obsessively focused on understanding the target, their logistics and the communications channels within the organization. Their grand objective is to prevail with the maximum strategic effectiveness. The last category are the massive group of strategists, which is usually consisted of amateurs. They loved to discuss their favorite tactical measures. Some of them are just operating from a handful of tricks while the rest are "one trick ponies." So, which of the three categories are you positioned at? We have noticed that the many so-called Sunzi experts have a tendency of telling their followers that all they needed to know about strategy was to follow the principles from the Art of War. Most of them do not know how to assess an opportunity with the Art of War principles. Interestingly, most of them do not know much about the various operational measures and the unique particulars that are concealed within the Seven Military Classics of Ancient China. One reader of their view found this "pseudo expert" from the Sunzi's Art of War Cult to be quite amusing and shallow. His view is an extension of his "know how." To prevail in any competitive situation, one must comprehend the specifics for mastering the means and modes. Spending some time collecting the data, can be a challenge. Click here on a modern day version of Jiang Tai Gong with a different twist.